What was the customers Business Need/Challenge? Client is a Print Media Giant, it is the third-largest newspaper in India by circulation. They want to build a Real Time Search Engine on their everyday news articles, to search the the articles by topic/entity of interest. Also, tag the article by sentiment to analyze the overall sentiment on different pages in paper. What solutions has Fragma delivered to drive the consumption of Azure? What impact did Fragma drive, how did the solution/offering address the customers business needs? Azure Search was used to store and build indices on unstructured news article data. 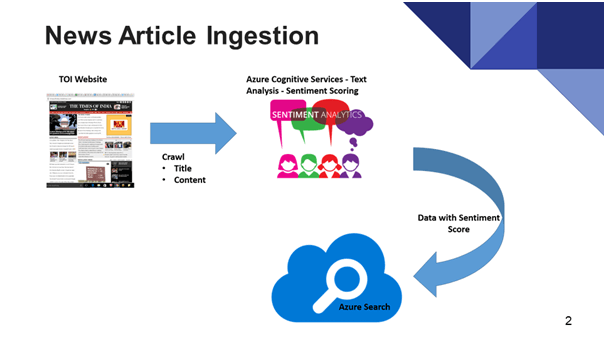 Azure cognitive services text analytics was used to predict the sentiment of article, the intense of sentiment was determined using the predicted sentiment score.